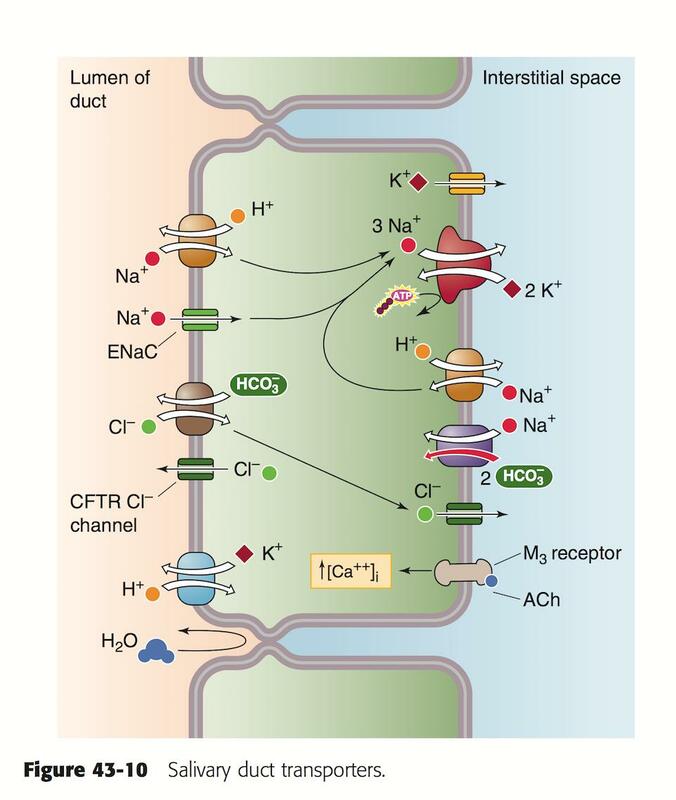 From the picture it can be seen that Bicarbonate is secreted into lumen of duct of salivary glands by exchanging Cl- ions. So if flow rate of saliva is increased then its obvious that less Cl- is taken in the cells and less bicarbonate is secreted out. But it is also said that when flow rate increases the bicarbonate concentration also increases and when flow rate decreases bicarbonate concentration also decreases. Doesn't this contradict the former fact? 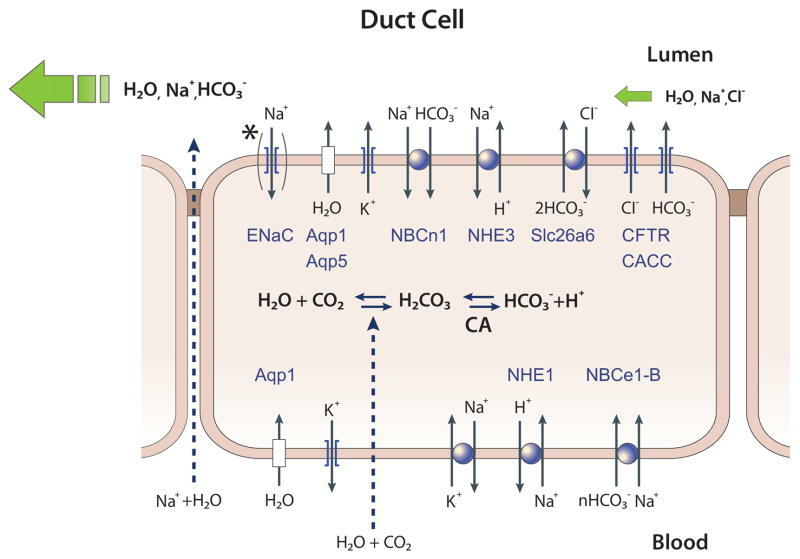 Yet another significant finding was the discovery of HCO3− absorbing mechanisms like NHE3 and NBC3 (NBCn1-A) at the luminal membrane of the ducts, which suggested the ducts absorb and scavenge HCO3− in the resting state. So, initially saliva is isotonic to plasma, it is both reabsorbed and secreted, if its flow is slow, more of bicarbonate is reabsorbed, if the flow is high less bicarbonate is reabsorbed. Therefore when flow rate increases bicarbonate concentration increases. At low salivary flow rates, HCO3- is reabsorbed by the striated duct cells and so very little reaches the mouth. At high flow rates, the striated ducts can't keep up and so HCO3- reaches the mouth at high concentration (<25mM)). Not the answer you're looking for? Browse other questions tagged human-biology physiology digestive-system or ask your own question. Why do ion concentrations change with different secretion rates in pancreatic juice?